1. What information AskNow gathers/tracks about you. 2. What we do with the information we gather/track. 3. With whom this we share the information it gathers/tracks. If you are a resident of the State of California and would like to opt-out from the disclosure of your personal information to any third-party for direct marketing purposes, please e-mail us at customerservice@asknow.com. Our goal in collecting personal information from you is to provide you with a smooth and efficient experience while you are using the psychic entertainment and other Services, and to keep you informed of opportunities available on our Service. This allows us to provide services and features that are most likely to meet your needs, and to customize our service to facilitate your experience. AskNow™ may create internal reports on user demographics and traffic patterns for our use and for use by our advertisers and partners. To the extent that customer credit card-specific information is collected by AskNow™, said information will be kept in confidence and will not be shared with any third parties (other than financial institutions processing the charge and consumer credit agencies) without the customer's prior informed consent. Notwithstanding the foregoing, AskNow™ reserves the right to share with third-parties the fact that they have credit card information on file for specific customers, but they will not share more than the last four digits of this credit card information with third-parties without the customer's prior informed consent. The personally identifiable information that you submit to AskNow™ remains your property. However, by submitting that information to us you grant AskNow™ the right to use that information for any legal purpose including, without limitation: a) effectuating a purchase from AskNow™; b) marketing purposes; c) providing promotional offers to you by means of e-mail advertising, text messages, push notifications, direct mail marketing, pop-ups, pop-unders and/or online banner advertising; and d) for validation, suppression, content improvement and feedback purposes. 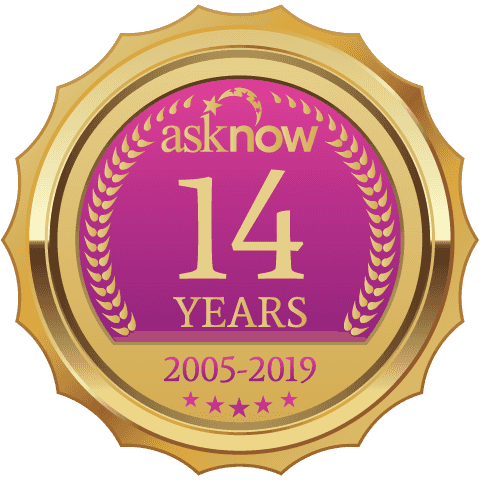 You agree that AskNow™ may contact you at any time with updates and/or any other information that we may deem appropriate for you to receive in connection with your continued use of the Website. We also use contact information from your registration data to send you information about AskNow™ and to keep you informed of our other products and services, and/or those of our affiliates, that may be of interest to you. Your contact information is also used to reach you, when necessary, regarding issues concerning purchases of our Service. If you wish to stop receiving future communications from us, please see the Opt-Out section below. Except as explicitly stated herein, we do not sell, rent or trade any personally identifiable information to third-parties. In addition, you agree that registering at the Website constitutes a purchase, an inquiry and/or an application for purposes of the Amended Telemarketing Sales Rule, 16 C.F.R. § 310, et seq. (the “ATSR”). Notwithstanding that your telephone number may be listed on the Federal Trade Commission’s Do-Not-Call List, AskNow™ retains the right to contact you via telemarketing in accordance with the ATSR. We may be required to disclose personal information in some instances, such as: 1) when required by law wherein we have a good faith belief that such action is necessary to comply with a judicial proceeding, court order, and/or subpoena; 2) in the event that AskNow™ is sold or acquired; 3) in the event that we believe that the Service is being, or has been, used in violation of our terms and conditions or to commit unlawful acts; or 4) for suppression purposes in compliance with the provisions of the CAN-SPAM Act of 2003, as amended from time-to-time. We use third parties to provide credit card processing services. When you register for AskNow™ services, we will share your name, address, telephone number and credit card information as necessary for the third party to provide that service. These third parties are prohibited from using your personally identifiable information for any other purpose. The Website or App may contain links to other third-party owned and/or operated content. AskNow™ is not responsible for any content, terms and conditions, or the privacy policies of such third parties. We encourage you to review the policies of these sites. Persons under the age of 18 (“minors”) are not eligible to register for, use and/or purchase the services and/or products featured on the Website. AskNow does not knowingly collect information from minors. No information should be submitted to, or posted at, through the Service by individuals under 18 years of age. We encourage parents and guardians to spend time online with their children and to participate and monitor the interactive activities of their children. All collected information is stored in a technically and physically secure environment. Access to collected information is not available to the public and is strictly limited. Our employees are dedicated to ensuring the security and privacy of all AskNow™ user information. To prevent unauthorized access, maintain data accuracy and ensure the correct use of information, we use appropriate industry standard procedures to safeguard the confidentiality of your personal information. In addition, AskNow™ has security measures in place to protect the loss, misuse and alteration of personal information under our control. We employ Secure Socket Layer Software (“SSL”) to protect certain financial information and associated data, and to secure any transactions. SSL encrypts information, including credit card numbers, as it is transmitted over the Internet. In compliance with applicable federal and state laws, we shall notify you and any applicable regulatory agencies in the event that there has been an information security breach. You will be notified via e-mail in the event. AskNow is not liable, to the extent permitted by law, for breaches in security arising from criminal acts of third parties. When you register with, or make a purchase of, the Service you will have the opportunity to “opt-out” of having your personally identifiable information used for certain purposes. If you no longer wish to receive email, text messages or push notifications, you may opt-out of receiving email by clicking on the “Unsubscribe” link located at the bottom of each e-mail by replying to text messages with “stop”, through the settings screen within the App, by emailing us at CustomerService@Asknow.com or by calling customer service on 1-800-660-1922 and following the subsequent instructions. Our highly trained Customer Service representatives will be happy to assist you 24/7.